If you have worked in an office or any work setting for a number of years, chances are you will watch some of your fellow colleagues age out of the rat race and retire. Although this can be an exciting time in the retiree’s life, it can be bittersweet for the rest of the workforce. If you have a beloved colleague retiring soon, you’ll likely want to find a way to make the last of their time on the job memorable. A wonderful way to do this is to give them a going away gift, complete with a greeting card! However, it can be hard to come up with the perfect retirement wish for your colleague. Sometimes, just getting a list of ideas can help you craft the perfect message that will send your adored colleague off with a smile on their face. The best retirement wishes are heartfelt and will leave the recipient smiling whenever they remember reading their card. We have gathered our favorite retirement wishes for colleagues and arranged them below by category. Feel free to take a look and pick a few to use for your retiring colleague! Do you and your colleague have a good rapport founded on inside jokes or gags? If so, consider using humor when writing your retirement wishes for them. Making someone laugh is a surefire way to brighten their day and a good joke can leave a lasting impression. 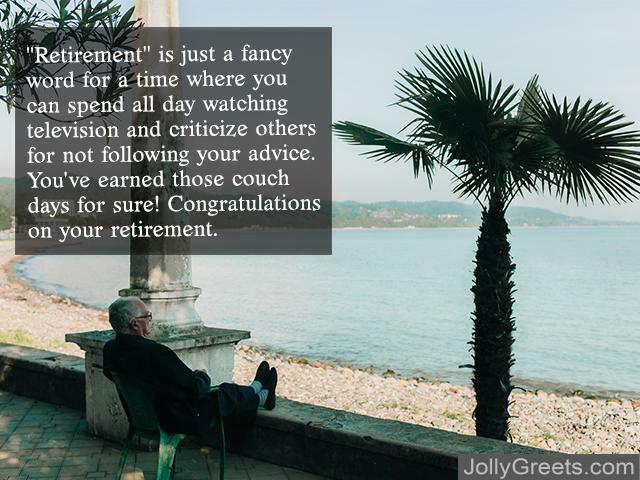 “Retirement” is just a fancy word for a time where you can spend all day watching television and criticize others for not following your advice. You’ve earned those couch days for sure! Congratulations on your retirement. Here’s what you can look forward to now that you’re retired: bingo night, dentures, and maybe an old folks’ home! All joking aside, you’ve earned your retirement and I hope you enjoy your newfound freedom. The funniest part of retiring is that you learn you really should have paid more attention to your 401(k) and medical insurance. Happiest of retirements, old friend! Are you sure you’re looking forward to retirement? Where will you get all your pens and notepads now that you can’t steal them from the supply closet? Congrats on retiring, enjoy the lack of “free” paper clips and staplers! If you consider climbing out of bed to climb on to the sofa and turn on your favorite shows, I’m sure that retirement will be an adventure! Congrats on making it over the mountain of the corporate world. Thanks for sticking around long enough to teach us whipper-snappers how things run around here! I hope you enjoy retirement: you have more than earned it. Sometimes when working together on a frequent basis, our colleagues also become our confidants and our friends. Using a heartfelt retirement wish for a colleague who has come to mean a lot to you is a wonderful way to send them off. Congratulations on all of your hard work and on finally achieving retirement! Now you can take time to do what makes your heart happy. Retirement is a good way to say “now is the time you stop living at work and start working at living.” Congratulations on many years of hard work, you deserve all you have achieved. Now is the time to make the rest of your life the best of your life. Thank you for all of your hard work and for all that you have done for me and the rest of the staff. Congrats on retirement! As a wise man once said: “now that you have climbed the mountain, you can finally enjoy the view.” I hope that you enjoy the view of your retirement! I hope that you are proud of all the hard work you have done over the years and you understand what a difference your presence here has made. We will sorely miss you, but no one is more deserving of a happy retirement than you. Be proud of all that you have accomplished over your many years of service and know that the wisdom you have shared with us all has been priceless. We will miss you around the office, but I am so glad you have achieved your retirement. All of us have a colleague who has helped us come into our own in the workplace. If your mentor is retiring, perhaps you should go with a well-rounded and respectful wish that show them how much their help has affected you. 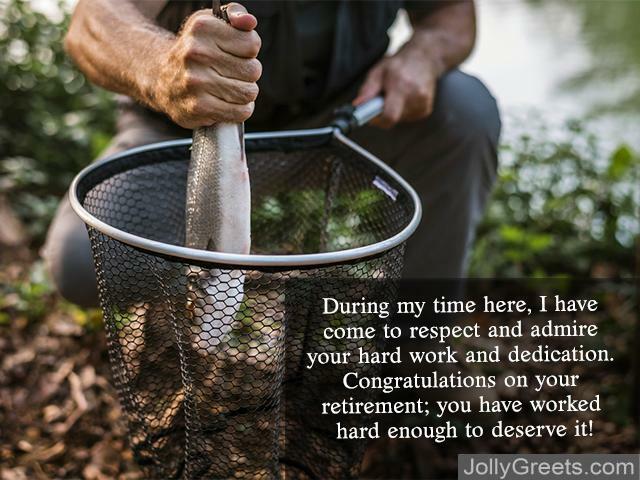 During my time here, I have come to respect and admire your hard work and dedication. Congratulations on your retirement; you have worked hard enough to deserve it! Congratulations on finally earning the time to do whatever you want. It is wonderful to see someone as deserving as you finally retire. Congratulations on retiring at the absolute perfect time. You are one of the hardest workers I have ever known and you deserve a great retirement. This is the beginning of the rest of your life and the best rest of your life. Congratulations and many well wishes for your retirement. You are one of a kind and you will not be easily replaced. We will miss you, but we are so happy to see you deserving your retirement. Congratulations on finally reaching retirement. I hope that you have found much happiness and fulfillment in the workforce; I hope you can continue to find meaning for your days. Did our list above give you ideas for writing the perfect retirement wish for your colleague? No matter the tone of your card, one of our suggestions should be perfect. Remember that personalizing your retirement message will mean the world to your colleague, so consider adding a personal anecdote or a story including both of you to really let them know how much they mean to you. Don’t forget to wish your colleague well on the next chapter of their lives! 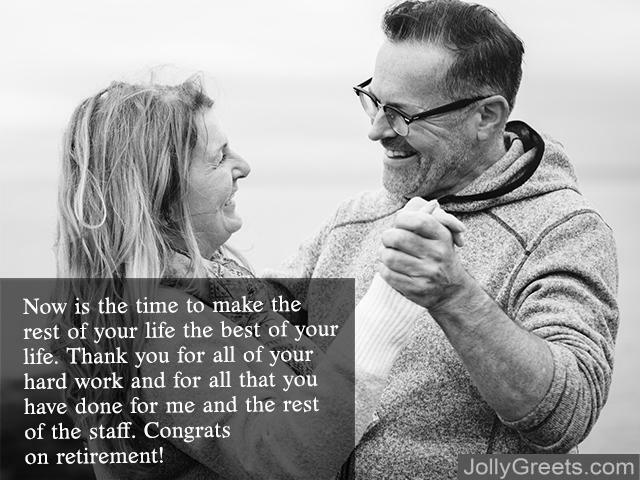 We hope that you find the perfect retirement wish for your colleague and we hope that they have a lifetime of happiness ahead of them.